Over the past couple of years, it seems, Americans have discovered the joys of Mexico City en masse. What they might not know — and what stylish locals long have — is that the city of Puebla, another design-and-food-rich destination, is just a two-and-a-half-hour drive southeast. With a population of 1.5 million, it too lies beneath misty mountains (including the still-puffing Popocatépetl volcano) and possesses a rich history. The Aztecs ruled the region until the Spanish arrived in 1519. The latter’s architectural contributions are the city’s blocks of candy-colored mansions and many churches, including the especially ornate Capilla del Rosario, with intricate carvings covered in 23-karat gold leaf. No doubt it helped make the town attractive to Napoleon III and his forces, whose defeat in the 1862 Battle of Puebla is commemorated by Cinco de Mayo. The largest point of commonality, though, is that like the capital, Puebla is in the midst of a cultural renaissance. A new generation has taken up traditional crafts, offering fresh takes on tiled table sets and hand-embroidered clothing in a much less expensive setting. Since 2016, Puebla has seen the opening of the International Museum of the Baroque, set in a curvilinear concrete building designed by Toyo Ito, and a dozen or so hotels and restaurants, almost all of which serve Puebla’s culinary claim to fame — mole poblano, a thick, earthy-sweet sauce of chiles, herbs and chocolate thought to have been invented by a group of 17th-century nuns. Some batches simmer for nearly three days, and the ingredients vary greatly from kitchen to kitchen. It’s the particular mix that lends each one its complexity, and really, the same could be said for Puebla itself, where multicolored tiled facades sit alongside gilded spires. Steps away from the Callejón de los Sapos (Alley of the Toads) weekend flea market, which has everything from beaded bracelets to figurines of the silver-masked Mexican wrestler El Santo, stands the 78-room Hotel Cartesiano, two renovated buildings — one an old tile factory, the other an 18th-century mansion — connected by a palm-tree-filled courtyard. Inside, there’s a mural in the modern lobby by José Rivelino depicting pre-Hispanic plants and fossils. After checking out the art, head to the rooftop pool or restaurant, where you should order the squash tacos sprinkled with dehydrated bean dust. In the residential Barrio del Alto, the year-old Rosewood Puebla has a royal blue exterior that matches the 2,458-square-foot tiled fountain out front, along with its own 300-year-old chapel. The 78 rooms have embossed headboards and wrought-iron chandeliers, as well as copper-nickel tubs in the bathrooms. Additional soaks can be had at the hotel spa, which offers a body-wrap treatment that uses cinnamon- and rosemary-infused cloths. Following stints in Barcelona and Paris, where he worked at the Michelin-starred Ze Kitchen Galerie, Angel Vázquez returned home to Mexico in 2003 to open his first restaurant, Intro, which fuses the flavors of various international cuisines (Swedish, Thai) with those he knew as a child. His new spot, Augurio — two blocks off the zócalo (main square) in the Quinta Esencia hotel — is more rustic but continues in the same culinary vein: Its mole poblano, with just 14 ingredients — and no chocolate — is based on Vázquez’s great-grandmother’s recipe. He’s also perfected various elevated riffs on chanclas — baked bread stuffed with chorizo, longanzia and ground pork and topped with a chile guajillo sauce. A leafy oasis in the heart of the city, this courtyard cafe has stone archways, lanterns and a vibrantly tiled tableau vivant of local heroes, from saints to actors to Don Cuco El Guapo, a ’90s-era robot that Puebla scientists taught to play the piano. Its chef, Liz Galicia, pays homage to her surroundings by using local produce and traditional cooking methods. Don’t miss her sampler of cemitas (tortas served on a brioche-like roll), or chiles en nogada (stuffed poblano peppers with a creamy walnut sauce). The latter is often followed by pasita, a sweet, prune-forward liqueur that is in turn chased with a cube of goat cheese. 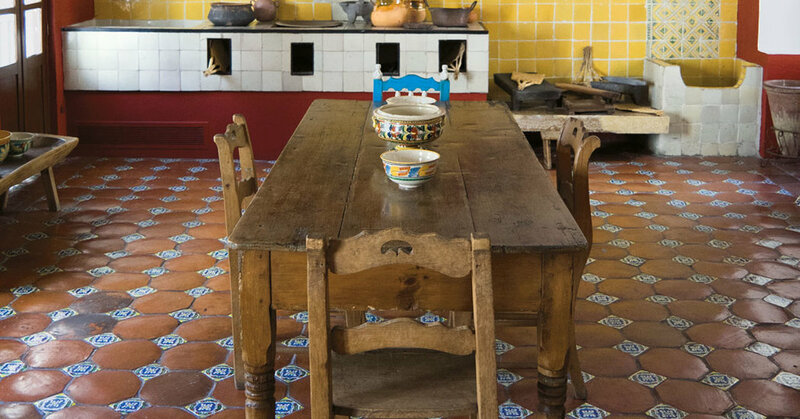 Puebla’s most coveted export, Talavera pottery is made by covering fired volcanic clay slabs, first with an opaque white glaze and then with hand-painted decorative motifs, most often in floral or celestial patterns. The technique, initially introduced by the Spanish, was kept alive after the Mexican War of Independence by a handful of cooperatives like Uriarte Talavera, which opened in 1824. Visitors to the workshop can observe the ceramists, who still use mule-hair brushes and the traditional sextet of colors (yellow, black, green, orange, mauve and blue), or make something of their own. There’s also a shop selling artisan-made teacups, platters and urns. In 2015, after studying textile design at Puebla’s Universidad Ibero, local Denisse Kuri opened her namesake boutique just west of downtown in Colonia La Paz. It’s filled with her own creations — embroidered cotton caftans and knee-length vests that she weaves on a backstrap loom — as well as leather and fringed hemp sandals, beach hats fashioned from jipijapa palm and pillows made by Chiapas-based makers affiliated with the artisan collective Kip Tik. On the lower level, a second shop sells thick wool rugs from Tlaxcala and fabrics embroidered by the Huichol people in Mexico’s Sierra Madre mountains. Toyo Ito’s hypermodern, earthquake-resistant design for this museum, with white, sail-like slabs of concrete reflected in a swirling fountain, is in stark stylistic contrast to its contents — paintings, sculpture, clothing and objects from the 16th- through the 18th-century Baroque period. Those in need of a break from the splendor can rest on one of the wavelike benches designed by Tokyo’s Fujie Kazuko Atelier or head up the helical staircase to the museum restaurant, Barroco, which has minimalist décor and colorful dishes (e.g., pulled pork with peas, radish and green beans) created by the esteemed chef Martha Ortiz. In the 1980s, a former hospital and the next-door 18th-century colonial mansion were converted into a public museum that now houses one of the country’s most important collections of colonial and pre-Columbian Mexican art. In addition to a Mayan altar and Aztec animal carvings, there are also works by the likes of Frida Kahlo and Javier Marín. Five years ago, the architect Enrique Norten oversaw a renovation of the two buildings that reconfigured the exhibition spaces to allow for digital installations and live performances, and he added terraces, gardens and a glass-cubed rooftop cafe that offers 360-degree views. Founded in 1646 by a bishop who offered up his 5,000-volume personal collection, Biblioteca Palafoxiana is one of the oldest public libraries in the Americas. Today, much of its content has been digitized, but the grand space, which still smells of paper and wood, tells its own story. Visitors cycle past the three tiers of wooden shelves, now filled with over 45,000 volumes, some of them handwritten. At the far side of this temple of books, you’ll see a gilded altar flanked by a mid-14th-century painting of the Madonna by the pre-Renaissance Italian artist Nino Pisano.